"The recipe came to us (Chicago Tribune) by way of Colonel Harland Sander's nephew, Joe Ledington of Kentucky. He says he found it in a scrapbook belonging to his late Aunt Claudia, Sanders' second wife. Ledington, 67, says he used to blend the spices that went into his uncle's world-famous fried chicken, and the recipe in question is the real deal." When temperature is reached, lower the heat to medium to maintain it at 350. Fry 3 or 4 pieces at a time, being careful not to crowd the pot. Fry until medium golden brown, turning once, 15-18 minutes. Transfer chicken pieces to a baking sheet covered with paper towels. Allow the oil to return to temperature before adding more chicken. Repeat with remaining chicken. Note: This would be very good with Portobello mushrooms. A note on MSG: A number of readers have asked how much MSG to use in the recipe above. 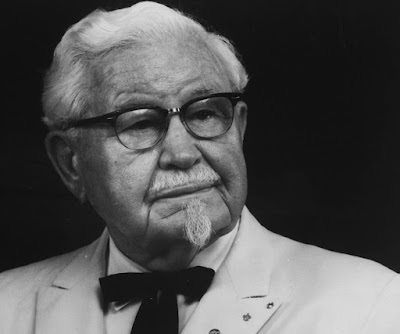 Although KFC has confirmed that its present-day recipe uses MSG, that ingredient was not part of the list of herbs and spices we received from the Colonel's nephew, so we didn't include MSG in the published recipe. But we did taste the fried chicken with a sprinkle of MSG. If you want to try the chicken with MSG, we suggest doing as we did: Sprinkle a little on the finished chicken pieces right before eating.